Each month we host a Graphic Novel Book Club meeting, open to all, during which we hang out and informally discuss a featured graphic novel. 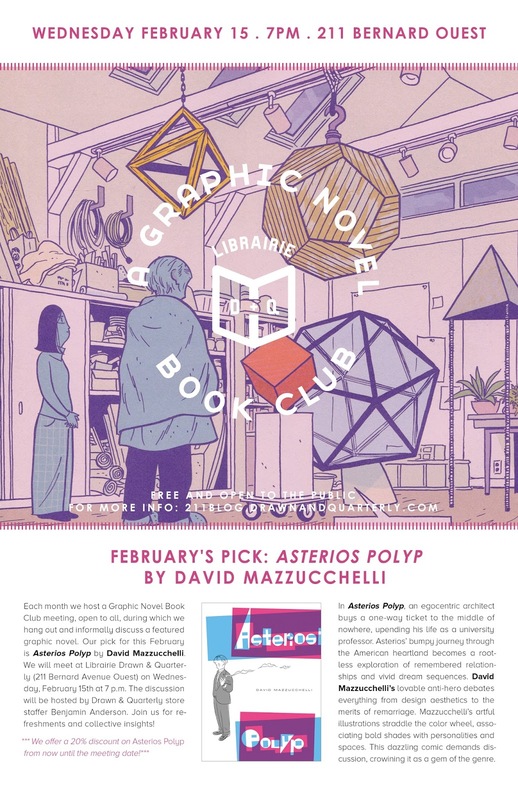 Our pick for February is Asterios Polyp by David Mazzucchelli. We will meet at Librairie Drawn & Quarterly (211 Bernard O) on Wednesday, February 15th at 7:00 p.m. The discussion will be hosted by D+Q store staffer Benjamin Bush Anderson. Join us for refreshments and collective insights! In Asterios Polyp, an egocentric architect buys a one-way ticket to the middle of nowhere, upending his life as a university professor. Asterios’s bumpy journey through the American heartland becomes a rootless exploration of remembered relationships and vivid dream sequences. David Mazzucchelli’s lovable anti-hero debates everything from design aesthetics to the merits of remarriage. Mazzucchelli’s artful illustrations straddle the colour wheel, associating bold shades with personalities and spaces. This dazzling comic demands discussion, crowning it as a gem of the genre.